The rapper was uninvited to the exclusive charity event after her physical brawl with Nicki Minaj at the Harper’s Bazaar Event. Cardi B’s appearance in last year’s Diamond Ball had everyone in the industry talking, with a Christian Siriano dress so grand it took four extra personnel to help carry. This year was sharp in contrast, though, as the rapper was reportedly uninvited to Rihanna’s upscale charity event. The fourth annual ball hosted a variety of celebrity guests from ‘Insecure’ star Issa Rae to ‘The Daily Show’s Trevor Noah. Childish Gambino took the stage to perform a few songs while items like all-inclusive Costa Rica trips and rare bottles of Armand de Brignac champagne were auctioned off in support of Rihanna’s Clara Lionel Foundation. Cardi was nowhere in sight as it has been reported that her welcome to the ball was revoked due to her behavior at this year’s Harper’s Bazaar NYFW party. Finding herself in a physical altercation with rapper Nicki Minaj, footage of shoes being thrown, and dresses being torn have taken over recent media. 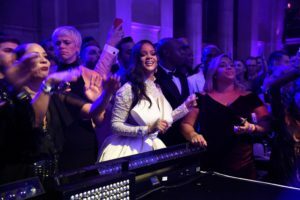 Rihanna has allegedly expressed apprehension about this kind of behavior happening at her event, choosing to uninvite Cardi. This would not be the first time someone in the industry has subtly shown their support of Minaj in relation to the feud, with Chance the Rapper, Jennifer Lopez, Ciara and Rihanna herself among others unfollowing Cardi on social media. Even Migos member Take Off, who raps alongside Cardi’s husband Offset, has followed suit. Cardi has remained publicly quiet since recent events, claiming she will “soon release receipts” in support of her side of the feud.